As a reviewer it is well to declare an interest. Robin Rowles is both an active member of London Historians and a highly-qualified guide with a love of London’s history that easily communicates itself in conversation, as it did to me when we talked some months ago about the Civil War in London both as a topic in itself and as the subject of this book. So I can be forgiven for approaching the book with rose-tinted glasses. Robin takes a somewhat old-fashioned approach and the book is none the worse for that. He is impeccable in the way that he credits his sources and the views of his fellow historians, and he ensures that those with only a limited understanding of the causes of the English Civil War have these background factors explained. He then tackles his subject thematically. I have one quibble with the structure of the book, addressed to its editor rather than its author, which is that it might have been better to have had some part of the penultimate chapter ‘London’s brave boys: the trained bands and the defence of London’ as the opening salvo. There may not have been any fighting in London itself, but that was partly due to the impressive defensive measures taken by the City of London’s Common Council and to the role of the Trained Bands in repulsing the King’s army at the Battle of Turnham Green, then some miles to the west of the twin cities of Westminster and London. As Robin points out, the London units and their extremely effective commander Philip Skippon also played an exceptionally important role in the wider Civil War. As to the meat of the book, Robin has a real insight into how the City was able to take on much of the machinery of national administration, with its networks of committees in some ways akin to those that would operate in Paris during the French Revolution. Their taking on this role being natural, due to the City’s long-established institutions and the ability of its governing Common Council to give overall direction. The centuries-old financial importance of the City of London to the Monarchy was symbolised by the longstanding pre-coronation tradition of the monarch being escorted to the Tower through the City gates by the scarlet-clad Mayor and Aldermen of London. With a detailed knowledge of its Livery Companies, Robin shows how the Parliamentarians were able to utilise the City’s long-established means of financing the monarchy in order to back its citizen enemies. He also demonstrates how this change of loyalty had been made a great deal easier through King Charles’s assault on the City’s privileges during the ‘Eleven Years’ Tyranny’ not least through the Crown’s confiscation of the City’s Ulster plantation. There are some intriguing details in the book to demonstrate that the City was far from universally solid in its support of Parliament, showing that some moderate Royalists were elected as Mayors during the mid-1640s before Charles’ resumption of hostilities in 1648 cut the ground from their feet, that is before Parliament was itself superseded by the army, with Skippon later becoming Cromwell’s Major General for the London area. The exceptional importance of religion in directing men towards either King or Parliament is affirmed and the means by which the Committee for Demolition of Monuments of Superstition and Idolatry set about their task are well described. Women also have their moments: not least the 1643 march on Parliament by City women, with their demonstration against wartime taxation and higher food prices being met not by the MPs, who were taking cover inside, but by Dragoons, with the fatal consequences persuading seven peers to desert to the King. George Goodwin FRHistS is the author of Benjamin Franklin in London: The British Life of America’s Founding Father. A guest post by LH Member Caroline Shenton. This article first appeared in London Historians Newsletter of August 2014. The paperback edition of her book, Mr Barry’s War, has just been published. Sir Charles Barry (1795-1860) is best-known as the architect of the new Houses of Parliament. With the designer AWN Pugin (1812-1852) he created the most iconic building in London, familiar to millions the world over as a symbol of Britain and democracy. It was a labour of love. Barry was a Londoner through-and-through: he was born, married, worked and died in London and, apart from three years on the Grand Tour as a young man, he lived there all his life. So where were the houses he inhabited in the city whose skyline he, more than anyone else, influenced by means of the biggest Houses of all? And can these buildings tell us something about a brilliant man who was discreet and private while he lived, and who remains an enigmatic character since he destroyed many of his personal papers before he died? Barry was the ninth of eleven children of Walter Barry, a government Stationery Office supplier. He was born and grew up at 2 Bridge Street, which ran along the northern side of New Palace Yard, Westminster. 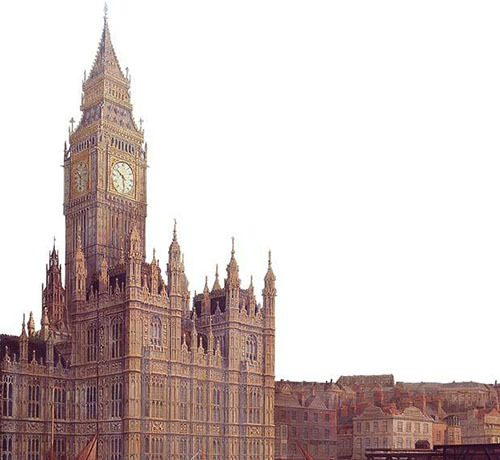 Some fifty years later Barry would construct the famous Clock Tower of the New Palace of Westminster, to Pugin’s design, almost adjacent to his birthplace, which stood in its shadow until 1867. Barry was christened at St Margaret’s Westminster, the parish church of Parliament, just a few steps from home. In the final decade of his life he also designed and oversaw the construction of a new Westminster Bridge. For the most of his life then, Charles Barry lived and worked in the immediate neighbourhood of the Houses of Parliament, old and new. When he returned to England in 1820 after travelling through Europe, the Levant and Egypt, he set up a home and office at 39 Ely Place, on the edge of Hatton Garden. Today this is a gated road containing residential buildings and legal chambers, but until the end of the eighteenth century it had been the Bishop of Ely’s Palace. It was sold off and redeveloped in 1772 and so Barry had chosen to live on a site with plenty of medieval resonance – including the gothic church of St Etheldreda – but in a house which by then was fifty years old and on the edge of a slum: definitely a first-time buyer’s option. Two years later he married Sarah Rowsell, daughter of a stationer friend of his father’s whose sister was already married to his brother. Sarah had patiently waited for him to return from his travels and then for a year or two after his return before he had enough money to support them – again a sign of his good sense and prudence. during World War II which hit the end of the terrace. We can assume it looked very like this though. 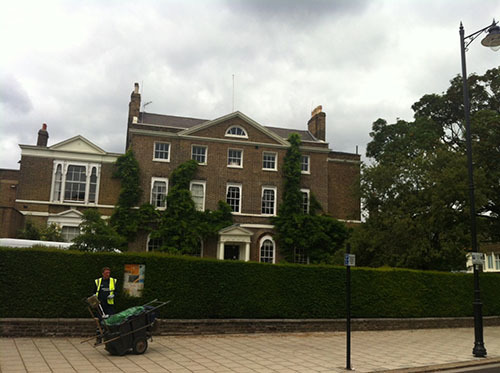 The Barrys continued living at Ely Place until 1827, when they moved to 27 Foley Place with their two sons – Charles jnr (b. 1823) and Alfred (b. 1826). In the previous seven years Charles had made a name for himself with projects in Brighton and Manchester and the young family’s move to the West End indicates his growing prosperity, and the fact that he was starting to socialise in fashionable Whig circles including members of the Devonshire House set. Today Foley Place has become Langham Street in Fitzrovia – and is just a stone’s throw from the RIBA on Portland Place, an institute of which Barry was a founding member and whose library today holds significant collections of his papers and architectural plans. Over the next thirteen years Barry won a series of brilliant competitions and commissions to design and build the Travellers’ Club in Pall Mall (1829); the Birmingham Grammar School (1833); Trentham House, Staffordshire (1834); the Reform Club in Pall Mall (1837); Highclere Castle, Berkshire better known as “Downton Abbey” (1838); and Trafalgar Square (1840), among many others. 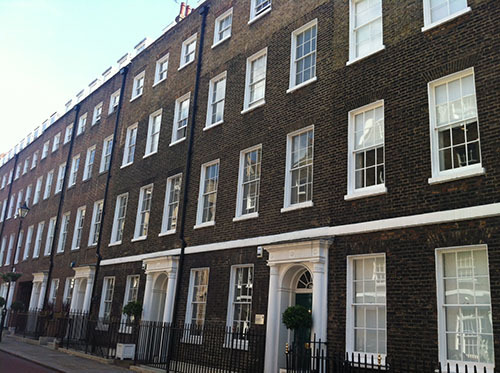 In 1840 Sarah Barry laid the foundation stone of the new Houses of Parliament, her husband’s most famous building, and that year the family (now including eight children and three servants) moved to a spacious mid-Georgian townhouse at 32 Great George St in Westminster – in fact, a continuation of Bridge Street where Barry had been born. This was not only to accommodate his large family better but also so that Barry could be as close as possible to the site of his ‘great work’ which was now growing into the air just a few hundred yards away. Great George Street was at that time a residential quarter favoured by politicians, civil engineers and railway contractors. At one point this included Samuel Morton Peto, whose firm had the building contract for superstructure of the new Palace of Westminster, and at number 23 lived and worked James Walker, the famous civil engineer who took over Thomas Telford’s practice and whose firm built the river wall and embankment for the Houses of Parliament in the late 1830s. Across the road from the Barry household was the original National Portrait Gallery, run by the Scharf family of topographical artists, and so this neighbourhood nicely encapsulates the main themes of Barry’s career. These houses no longer exist but a vestige of those times remain as 1 Great George Street is now home to the Institution of Civil Engineers. At the very end of his life, Barry moved to the semi-rural delights of 29 Clapham Common North, to a grand mansion called ‘The Elms’. Exhausted and fatally stressed by some 25 years of work on the new Houses of Parliament, he perhaps felt the need to at last relax in comfort and enjoy the semi-rural delights of the Common where sheep still grazed. He died just a few months later, in May 1860, of a massive heart attack. His funeral cortège set out from The Elms on 22 May and led to Westminster Abbey, where Barry was buried under a brass depicting the Victoria Tower of the Palace of Westminster, which the great architect regarded as his masterpiece. Today, no 29 is part of Trinity Hospice, which has occupied the building since 1899. Caroline Shenton was formerly Director of the Parliamentary Archives and is now a freelance writer, historian and heritage consultant. Her latest book Mr Barry’s War. Rebuilding the Houses of Parliament after the great fire of 1834 was a book of the year for BBC History Magazine and The Daily Telegraph. Follow her on twitter @dustshoveller or read her blog on Parliamentary history at www.carolineshenton.co.uk. I was surprised and saddened to hear only yesterday that Derek ‘Del’ Mandel, aka the Cockney Minstrel, had passed away earlier this year on St George’s Day. As many readers know, our monthly meet-up pub is the historic Hoop and Grapes in Farringdon Street. Every year, early November, after the Lord Mayor’s Show, Del would turn up and lead a proper cockney-style singalong, in his pearly king garb. He’d start fairly low key with both well-known and obscure standards as well as soldier ballads. Before each song he explained the story behind it, so we all got educated into the bargain. Del’s set was immense, typically lasting well over three hours. Indeed, Springsteen-esque. He invested heart and soul and his audience responded lustily. As we punters became more refreshed, our voices became louder and louder. By the end of the afternoon, I swear the tiles on the roof were rattling. Thank-you Del, wherever you are. We’ll never forget you. Del will be remembered in a special sesh at the Hoop and Grapes after the Lord Mayor’s Show this year, 10 November. Here is a clip of Del doing the Barrow Boy Song, on 11 November 2016. A guest post by LH Member Prof Sheila Cavanagh. Prior to 2011, I did not know that the City of London Livery Companies existed. I am now a liveryman of the Worshipful Company of Educators and have exercised my statutory right to herd sheep across London Bridge. Since then London Historians have made a number of memorable visits to Livery Halls and having been fortunate enough to have talks on the subject by fellow member Paul Jagger, I would like to offer a few thoughts regarding this venerable tradition from the perspective of someone who has been introduced to these customs and building fairly late. My first encounter with the Livery Companies came when I was invited to participate in the celebrations and the luncheons surrounding the Worshipful Company of Poulters Shrove Tuesday Pancake Race outside the Guildhall. Nothing in my previous experience prepared me for this energetic occasion, where crowds of people in elaborate costumes ran (sometimes in high heels) up and down the course, carrying a skillet containing a pancake that appeared to have been made of concrete. The ceremonial trappings of the occasion were unescapable, as the various Livery Companies offered their distinctive contributions to the event. The Poulters provided eggs, the Gunmakers supplied the starting pistol, the Ironmongers brought the skillets, and various other Companies shared varied skills and items associated with their trades. The event was memorable, particularly for the graciousness of the crowd, and also at the luncheon that followed the main event. While one hopes that no one ate the remarkably resilient pancakes repeatedly carried across the Guildhall yard, the feast that followed the Race was convivial and delicious. Lord Mayor Andrew Parmley (2016-17) rather tentatively showing how it’s done. Image: Worshipful Company of Poulters. After attending a couple of more Livery events and visiting some historic Livery Halls, I decided to pursue membership myself, although I felt more comfortable following my own profession into the fairly recently chartered Worshipful Company of Educators rather than investigating one of the more established Companies associated with trades far out of my realm of expertise. I also wanted to demonstrate that I had taken seriously the charge associated with my tenure as the Fulbright/Global Shakespeare Centre Distinguished Chair, which urged me to become involved in a range of local activities and organisations during my time in England (the London Historians obviously take pride of place in this endeavour). Consistently, the groups gathered for Livery functions have been welcoming and interesting. Recently, for example, I attended a Shrieval Luncheon hosted by the Honorable Company of Master Mariners on HMS Wellington to mark the 2018 election of Sheriffs. As usual, I was surrounded by a fascinating and congenial group of people, this time representing a range of maritime related professions. I had expected to be relegated to a side table for this event (the equivalent of what Americans call “the Children’s Table” at holiday gatherings). Instead, I ended up seated in the company of The Lord Mountevans, 2015’s Lord Mayor of London and the current Master of the Honorable Company of Master Mariners, Captain R.B.Booth MNI. While this seating arrangement was not or anticipated, it fits well within my experience of the Livery Companies. When LH Member Tina Baxter and myself herded sheep across London Bridge, for example, I found myself assigned to the same group of sheepherders as prominent actor and director Mark Rylance. As the London Historians who have visited Livery Company Halls in conjunction with our delightful LH comrades know, these occasions are always memorable. From the Barber Surgeons Hall, to the Tallow Chandlers, the Goldsmiths, and the other Halls visited, and to the current exhibition at the Guildhall Library highlighting the Worshipful Company of Tylers and Bricklayers, the City of London Livery Companies have a great deal of history to share as they help create the history of the City that is to come. I don’t always understand all the traditions associated with the them, but I look forward to learning more from this group of charitable professionals so central to the City of London. Tylers and Bricklayers Company display at Guildhall Library, 2018. Our visit to Apothecaries’ Hall, 2018. Outside Barber Surgeons’ Hall after our visit, 2018. This article, by London Historians member Laurence Scales, first appeared in our monthly members’ newsletter from April 2018. I recently had my hand on some squares of black silk lace, made by young girls of Bridgenorth in 1774, the residents of a workhouse. This was over fifty years before Sir Edwin Chadwick’s ‘reforms’ and some workhouses were enlightened. Training girls to make lace could save them from destitution. A few months ago I was invited by the Historian in Residence at the Royal Society of Arts (Royal since 1908), to help catalogue some papers. I cannot claim that they are new discoveries, just that they are little seen. No one has had the time to make the list, until now. So, once a week I commute into the 18th century to make more accessible for future researchers this stash of cultural heritage. The RSA started in Rawthmell’s coffee house, Covent Garden, in 1754. Since 1774 it has lived in a fine Adam building nearby, now awkwardly equipped with lifts and network cables, and with one or two steps scattered in odd places as if to catch the unwary. The RSA, full name the Royal Society for the Encouragement of Arts, Manufactures and Commerce (n.b. it has not much to do with art), is not to be confused with the famous scientific Royal Society for the Improvement of Natural Knowledge, nor the Royal Academy of Arts, nor yet the Royal Institution. Dr Johnson was a member of the Society of Arts, as was Benjamin Franklin, William Wilberforce and Karl Marx – and a few other members will make an appearance shortly. Turnip rooted cabbages, starting a forest from acorns, new recipes for manures, hats made of wood shavings to rival those from Leghorn, cobalt glazes, carrot marmalade, medicinal rhubarb, whale harpoons, and zebra wood from the Mosquito Shore – these all became a focus for the Society of Arts in its first 50 years. It was a period just before progress began to be clearly identified with science, so prizes were awarded for enlightened and patriotic efforts to fill particular wants or shortages in agriculture, colonies and trade, manufacture, chemistry, mechanics and ‘polite arts’. ‘Art’ used to cover all the other things in the list, not just drawing and sculpture. There were also bounties awarded for unsolicited worthy efforts such as lace making at Bridgenorth. The ‘Great Room’ of the RSA as depicted c.1810. It remains, complete with allegorical paintings by Sir James Barry. I see some intriguing items in a day – mostly letters, but sometimes there is drawing, or an ear of wheat, or a square of black silk lace – an exhibition in microcosm, in fact. The Great Exhibition of 1851 was a later initiative by this Society, by the way. Drawing included with a letter about harpoons, presumably just for the joy of it, in 1777. It may seem I have found a rather out-of-the-way interest at the RSA. Not so. That recipe for carrot marmalade was eventually copied to Captain Cook at Deptford to try out for a long voyage and avoid scurvy. But it turned out that he did not like it and watered his crew with pine beer instead. A Simple Diagram, Georgian Style. Yoke for Ploughing with Oxen Instead of Horses. And who cares about acorns? Well, the Royal Navy did for a start. And people needed firewood. And then there was new interest in smelting. By 1775 England was going bald. Over 50 years or so the RSA prompted the planting of 50 million trees. (It is believed that the great storm of 1987 only toppled 15 million trees.) While deforestation was one concern, others were already starting to worry about pollution and occupational diseases, and to come up with remedies. Those awarding the prizes at the Society often did not see the thing they were rewarding. It was a strangely egalitarian society in the sense that the Earl of Winterton, for example, to be considered for his medal had to get his illiterate farm hand (‘X, his mark’) to sign a certificate attesting to the fact that he really did plant all those acorns that the Earl claimed. Sometimes it was the other way round, the farm hand invented something and had to get his boss to testify to its efficacy – the fumigating bellows for example, against ravening caterpillars, tried out in the royal gardens at Kew. Correspondence about manure and rhubarb criss-crossed the land, long before the penny post. The postal service was very good, even if the best address someone could give was the wagon stopping outside the Bear and Ragged Staff at Smithfield – or at the Artichoke, Radcliffe Highway. Another member or fellow of the Society was John Howard, the first person ever to be described as a philanthropist. The Howard League for Penal Reform is a name you hear in the news sometimes. But he did not found it. It is named in his honour. John Howard was a landowner of Bedfordshire, interested in new strains of wheat. ‘I often eat some good puddings made of that Turkey wheat,’ he said in a letter to the Society in 1772. In 1773, when he was aged 52, he suddenly began an obsessive round of visits to hundreds of prisons. Having been appointed High Sheriff of Bedfordshire he took the job sufficiently seriously (unlike some) that he visited his local jail, and was horrified to find that the only pay received by the jailer had to be found by the prisoners. And many of the prisoners were there because of their debts! It was the same everywhere else in England. Howard then devoted himself to improving prisons for the next 17 years until he died of typhus, from poking his nose into a prison in the Ukraine. Holland produced the best prisons, but at least Britain produced John Howard. His modest Bloomsbury home rightly wears a blue plaque, the heritage scheme started by the Society in 1866. That scheme has now landed with English Heritage, and imitators. The RSA starts things and then hands them on. The RSA continues good work. I risk sounding like a commercial. But my real point is that I always come away from the RSA with a feeling of optimism about what people are capable of, even those who are not superhuman. Georgian life was a hard grind, and often cut short. Here was a bunch of rich Georgians rewarding a bunch of usually less well-off people for doing something outside their usual toil, public spirited, worthwhile, perhaps risky, often something as little as planting experimentally a few rows of medicinal rhubarb. Not selling it, mind – just planting it to see if it would grow, for a better future. That spirit is real cultural heritage. Another happy ending, from 1768. Laurence Scales is a guide specialising in offbeat historical walking tours focusing on intriguing and amusing tales of discovery, invention and intelligence. He is a volunteer working at the Royal Institution for which he has devised walking tours, and also guides walks and tunnel tours for the London Canal Museum. Welcoming residents and visitors who want to look beyond the main London attractions he reveals a wealth of lesser known historic sites and offers a double-take on some famous ones. Please contact Laurence via his web site.